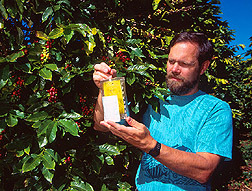 entomologist Roger Vargas apply protein bait droplets to coffee leaves to evaluate their attractiveness to Mediterranean fruit fly and its natural enemies. (K8845-1) A new, environmentally friendly insecticide called spinosad may soon become a widely accepted alternative to the malathion sprays used today for fighting insect pests such as the Mediterranean fruit fly. Medfly can attack more than 200 different kinds of fruits and vegetables and ranks as one of the world's worst insect pests. In California, medfly battles have cost taxpayers nearly $500 million during the past 25 years. A 1997 attack on medfly in Florida's Tampa Bay region lasted 9 months and cost $25 million. Spinosad gets its name from the microbe that produces it, a soil-dwelling bacterium called Saccharopolyspora spinosa. When applied at recommended rates, spinosad poses less risk than most insecticides to mammals, birds, fish, and beneficial insects. That's why Agricultural Research Service scientists in Hilo, Hawaii, and Weslaco, Texas, are exploring its potential. fruits that house the coffee beans. (K7022-6) Spinosad is already approved for use on more than 100 crops, including apples, almonds, citrus, eggplant, tomatoes, and cotton (see "Spinosad Tests on Cotton Pests—Bollworms and Budworms," below). 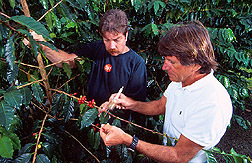 In coffee fields in Hawaii, ARS scientists compared spinosad to malathion and to phloxine B, a red dye widely used in cosmetics, pharmaceuticals, and other products. Phloxine B is also a promising alternative to malathion insecticide. The scientists looked not only at each chemical's effectiveness in zapping medflies, but also at its effects on one of the most important natural enemies of medfly in Hawaii—a tiny wasp known asFopius arisanus. The female wasp lays her eggs inside the developing medfly egg. A young wasp grows inside the medfly, eventually killing it.F. arisanus wasps are harmless to humans. 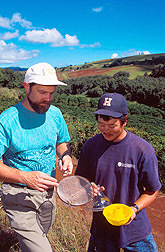 Steven L. Peck, formerly with ARS and now with Brigham Young University, along with entomologist Roger I. Vargas and biologist Grant T. McQuate of the ARS U.S. Pacific Basin Agricultural Research Center in Hilo, Hawaii, led the experiments. They worked with entomologists John W. Armstrong at Hilo, C. Glen Jackson of ARS at Phoenix, and John D. Stark of Washington State University, Puyallup. Biologist Grant McQuate examines the sticky insert of a trap baited with a synthetic food bait. The traps in this coffee crop are used to catch medflies to assess the effectiveness of spinosad. 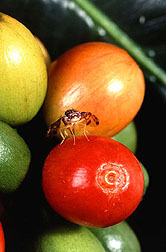 The scientists selected coffee fields for the test site because medflies love coffee berries. The insects don't harm the crop, though they do lay their eggs in the ripening, cherrylike fruit that houses the coffee beans. Each chemical was combined with a bait to entice the medflies to eat. "Malathion was more effective than either of the two alternatives in controlling the medflies," reports Peck. " But both spinosad and phloxine B gave impressive levels of control. Our results suggest spinosad and phloxine B may need to be applied more frequently than malathion, but the total amount of active ingredient put into the environment using spinosad or phloxine B would be far lower." Colleague Vargas' scrutiny of the beneficial wasp showed that the little reddish-brown-and-black insect "had high susceptibility to malathion and low susceptibility to both spinosad and phloxine B." He says the findings also suggest the wasp "might be an ideal candidate for use—in conjunction with spinosad or phloxine B—in an experimental areawide program for suppressing medfly and several of its pestiferous relatives in Hawaii." Sexually sterile medflies could be added to the arsenal. "Spinosad could be used first, to knock down most of the medfly population. Then, sterile medflies could be released perhaps a week or so later," explains Vargas. When sexually sterile males mate with wild females, no fertile offspring result—meaning the population should crash. "The combination of using spinosad plus the sterile-insect technique," adds Peck, "has the potential to suppress medfly populations to even lower levels than malathion alone." The Hawaii tests required trapping flies for 10 weeks, applying sprays for 8 of those 10 weeks, and harvesting more than 150,000 berries from some 25,000 coffee plants. This was one of the most extensive field studies ever conducted on the effect of these chemicals on medfly and theF. arisanus wasp. 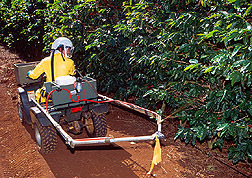 Technician Russell Ijima uses an all-terrain vehicle to apply a band of protein bait spray (containing spinosad) in a coffee field. Unlike malathion, which can kill insects that come in contact with it, spinosad kills mainly by ingestion. Improving the baits needed to entice hungry medflies to eat spinosad is the intent of a new cooperative research and development agreement between an ARS lab in Weslaco, Texas, and the manufacturer of spinosad products, Dow AgroSciences LLC, of Indianapolis, Indiana. The research on spinosad fits right into the mission of Weslaco's Crop Quality and Fruit Insects Research Unit, led by Robert L. Mangan. Located near Mexico, where citrus is grown for international trade, Mangan's team researches new, environmentally safe ways to keep the fruit free of insect pests. In laboratory studies by entomologists Mangan and Daniel S. Moreno, most Mexican fruit flies died within 72 hours of eating their fill of a bait containing 1 part per million (ppm) spinosad. Similar results followed in lab experiments with sapote and Caribbean fruit flies. bait trap used in a coffee field. (K8846-1) "We formulated several baits so the flies could tell us what they liked best," says Mangan. The winning delicacy: a combo that basically consists of hydrolyzed spray-dried protein and an assortment of inert ingredients. Called Solbait, the ARS-developed elixir is now registered for emergency use with spinosad to control or help eradicate fruit flies in Florida. Besides being tasty to fruit flies, Solbait has other desirable features. It can be applied with conventional spray equipment, and it clings easily to citrus foliage. In the lab tests, a minuscule 0.159 ppm concentration of spinosad in Solbait proved lethal to 50 percent of the Mexican fruit flies in 72 hours, as did 0.14 ppm for medflies. Similar concentrations were as effective against other fruit flies. In comparison, a malathion dosage about three times higher (0.44 ppm) was required to kill 50 percent of the Mexican fruit flies as well as Caribbean and West Indian fruit flies. Moreno and colleagues with the Florida Department of Plant Industry and Dow AgroSciences conducted 6-day field tests of spinosad in De Soto County, Florida. The results: 80 ppm spinosad in Solbait was as effective as 195,000 ppm malathion in the standard hydrolyzed protein spray used to apply this chemical. Now the scientists want to enhance spinosad's effectiveness—in combination with Solbait—so even smaller quantities of the insecticide could be used.—By Marcia Wood and Ben Hardin, Agricultural Research Service Information Staff. To reach the scientists mentioned in this article, contact Marcia Wood, USDA-ARS Information Staff, 800 Buchanan St., Albany, CA 94710; phone (510) 559-6070, fax (510) 559-5882. ARS agricultural engineer Ivan W. (Buddy) Kirk and entomologist Jesus F. Esquivel at College Station, Texas, have years of expertise developing new tactics to fight two of cotton's worst enemies—cotton bollworms and budworms. So, Dow AgroSciences LLC, makers of spinosad, invited the scientists to test this new insecticide in some commercial cotton in the state. "Cotton bollworms and budworms have developed resistance to many standard commercial insecticides," says Kirk, who is with the Areawide Pest Management Research Unit in College Station. "These insects infest over 75 percent of the U.S. cotton crop." Kirk and Esquivel conducted the experiment on a 200-acre commercial field of conventionally bred cotton in Burleson County, Texas. Some plots were sprayed with spinosad; others received standard pesticides. The researchers evaluated spray rates of 2 and 5 gallons per acre and droplet sizes of 200 and 400 microns. Spinosad was more effective when aerially applied with the smaller (200-micron) droplet size and the higher (5-gallon) spray rate. Commonly used spray rates for standard insecticides average only 2 to 3 gallons. However, cotton treated with spinosad "had fewer damaging bollworm and budworm larvae than plots treated with the other pesticides," Esquivel says. "Larvae found on cotton treated with standard insecticides were more mature, suggesting that spinosad prevented small larvae from becoming larger and more damaging. Our findings also suggest that some larvae were probably resistant to the standard insecticides." Too, the experiment helped establish that spinosad is nontoxic to most beneficial insects. "More lady beetles and pirate bugs were found on cotton treated with spinosad than with the standard insecticides," says Esquivel. The study was conducted through a trust fund cooperative agreement between ARS and Dow AgroSciences.—By Linda McGraw, ARS. Ivan W. (Buddy) Kirk and Jesus Esquivel are at the USDA-ARS Areawide Pest Management Research Unit, 2771 F&B Road, College Station, TX 77845; phone (409) 260-9584, fax (409) 260-9386. "Spinosad Battles Crop Pests" was published in the April 2000 issue of Agricultural Research magazine.